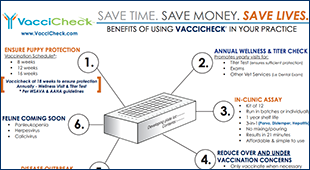 Have a question or comment about VacciCheck? Be sure to check out our FAQs page for answers to some of our most common questions! All other inquiries, please fill out the form below and we will get back to you within 24 business hours. Are you a pet owner rightfully concerned about over-vaccination consequences? Your veterinarians may not know about this affordable and effective alternative. Bring this one page handout to your Veterinarian and talk to them about titer testing with VacciCheck!